I’m sitting here thinking about cake. Sitting, not writing, because in-and-of-itself, cake does not tend to inspire in me particularly strong feelings. But here’s the thing about cake: even if you’re not a cake person per se, chances are you’ve encountered one or two in your life that stayed with you and that function as a kind of gold standard against which all future cake eating experiences are measured. Like the chocolate layer cake my grandmother used to have waiting for me when I’d visit her in Virginia. I was a small kid at the time and can’t remember much about that cake other than the way the perfect waves of chocolate icing would call to me from beneath the glass cake dome it was hiding under, perched high up on my Nanna’s kitchen counter — that, and the fact that I could never get enough of it. Who knew that all subsequent forkfuls of chocolate cake would rise or fall against that memory? Among this small group of standout cake experiences I’d also include the carrot cake our across-the-street neighbor in Philadelphia, Barbara, used to make when I was growing up (I’ll get you that recipe soon; I’d bet money it’s the only carrot cake recipe you’ll ever want), as well as the chocolate-with-vanilla-buttercream-icing-and-a-sprinkling-of-chocolate-chips layer cake from Billy’s Bakery (they simply call it their “Classic Chocolate Cake”), which for pure tooth aching goodness is my ideal when it comes to celebrating birthdays. 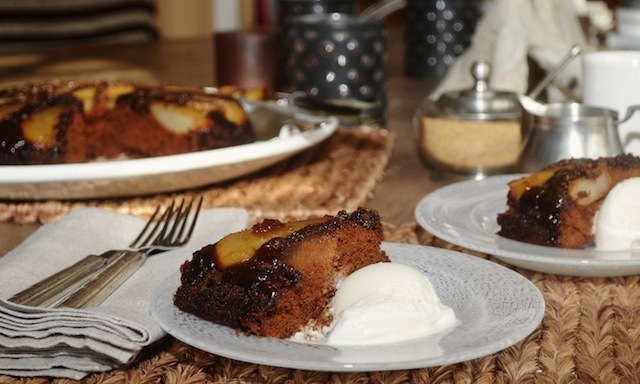 And, in case you were starting to think it was all about the icing for me, I’d also nominate the upside-down pear gingerbread cake that I bring to you here, which despite its toffee-like topping is definitively icing-free. 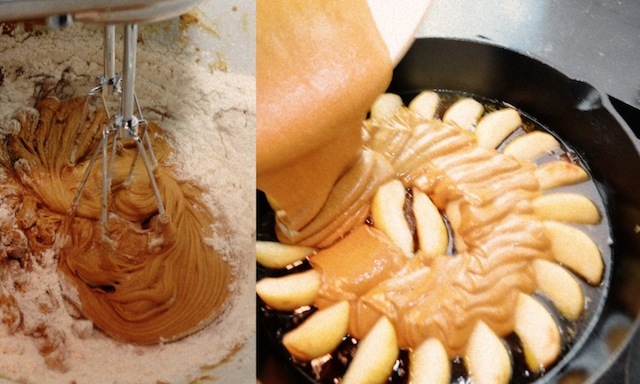 I pulled the recipe out of Gourmet almost ten years ago (the page has begun to take on the same appealing color as the baked pears which crown the actual cake), and while it’s not something I make all that often, each time I do I wonder what took me so long. It’s also the sort of dessert that feels just right when there’s a snap in the air. There are a couple of reasons for this: the first is that this is gingerbread we’re talking about, so there’s nothing particularly delicate or ephemeral about it. This is a cake with heft, both in terms of its weight as well as in the way that the kick of the ginger and cinnamon and cloves meld with the sweetness of the molasses and the baked fruit. 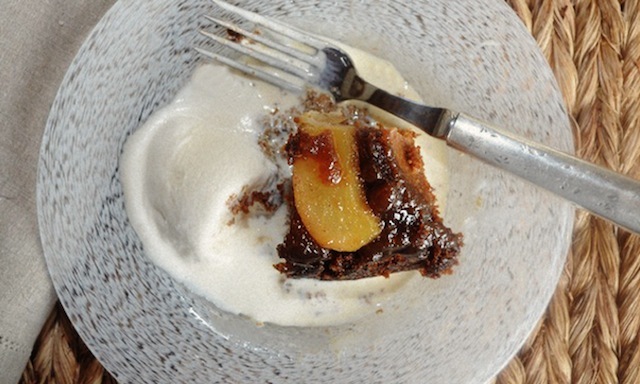 There’s also a generous amount of brown sugar called into play here and together this trio (the fruit, the molasses, the sugar) ensures that the cake will have all the sweetness you might want, and that the uppermost layer will have a sort of toffee-like quality that generously works to moisten each slice, each mouthful. And then there’s the fact that the whole thing is baked in a skillet — something that always strikes me as seasonally appropriate, not to mention strangely satisfying. 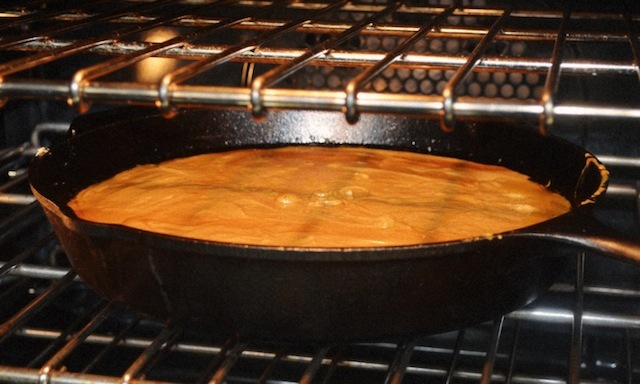 I’ve noticed this when I’ve made skillet cornbread, and I’m aware of it each time I make this cake. 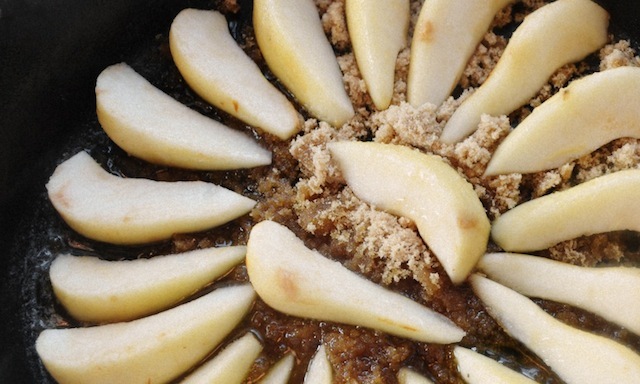 In this instance I suppose I like the economy of baking in the same pan that’s used on the stovetop — first to melt the butter and the brown sugar, then to gently cook down the pears. And perhaps there’s also a whiff of romance at play, some fantasy of how one used to cook a hundred years ago. I like that . . . as long as I can experience it while using my very contemporary oven. And even if the whole skillet thing holds no magic for you (you can also use a 12-inch nonstick frying pan, the handle wrapped twice in foil—just make sure the pan is deep), there are lots of other little pleasures to be had as you assemble the cake, and even as it does its time in the oven. Among those I’d include the fanning out of the pear slices in the pan, which can make you feel like a master baker — even if it requires no particular skill or artistry. There’s the pleasure of watching the butter, sugar, and egg mixture go thick and molten as first the flour and spices, and then the molasses and hot water, are added in increments until what you’re left with is something so dark and bewitching you can barely keep your fingers out of it (an impulse that’s only heightened once said fingers reach your mouth). Nor can you discount the powerful pull of the scent that gradually fills your kitchen, a smell that for most people is larded with memory, but that even without this has no equal in its enticing mix of sweet and spice. But perhaps the greatest fun is to be had at the very end, when the cake has cooled for a few minutes and is ready to be inverted onto its serving plate (warning: muscles required here). 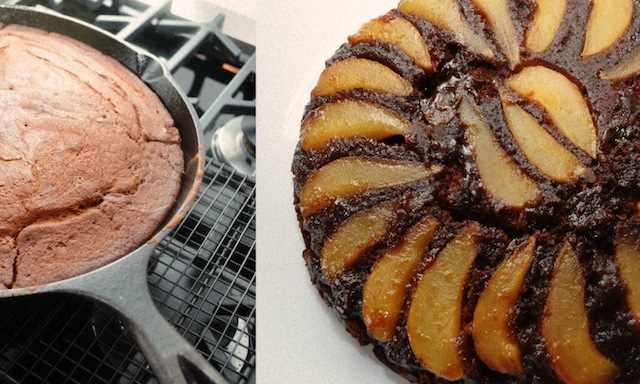 We all know what lies at the base of that pan, but there’s still a distinct thrill in seeing it for yourself — the way those perfect slices of pear have gone all golden, the way the brown sugar has turned to caramel and infiltrated the body of the cake. It’s a guaranteed I made that? moment, matched only by that first forkful, and then the second, and so on. 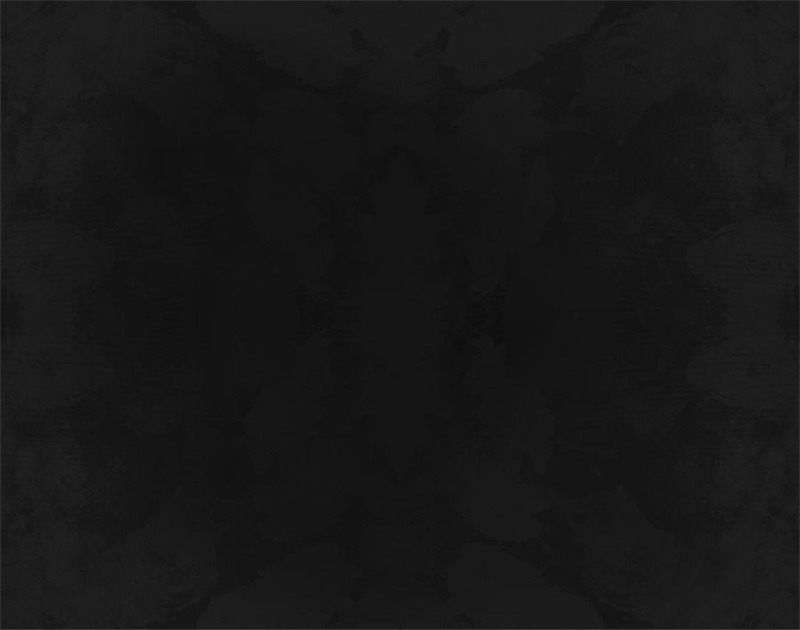 Am I over-hyping this thing? I don’t think so. Add a scoop of vanilla ice cream (the cool temperature — and the cooling flavor — seem to round out the entire experience in some inexplicable way) and I think you’ll agree. A final thought: though the recipe claims to serve 6, for once I’d raise that — to 8. Man-sized appetites notwithstanding, this is a big cake with big flavor. In other words, there’s plenty to go around. Happy fall. *There are three types of molasses: mild or barbados (also known as “first molasses”), dark (or “second molasses”), and blackstrap (sold as a health supplement and also used as an ingredient in cattle feed). The mild variety has the most sugar and is the grade most commonly used in baking. While not all mild varieties are listed as such, the fine print should indicate whether it’s what you’re looking for. Barring that, the two most common brands are Grandma’s and Brer Rabbit. The Grandma’s variety with the yellow label and marked “original” is, in fact, mild, whereas Brer Rabbit is sold in each of the three varieties, with the grade clearly labeled. —A well-seasoned 10-inch skillet or a 12-inch nonstick skillet, deep (handle wrapped with a double layer of foil if not ovenproof). 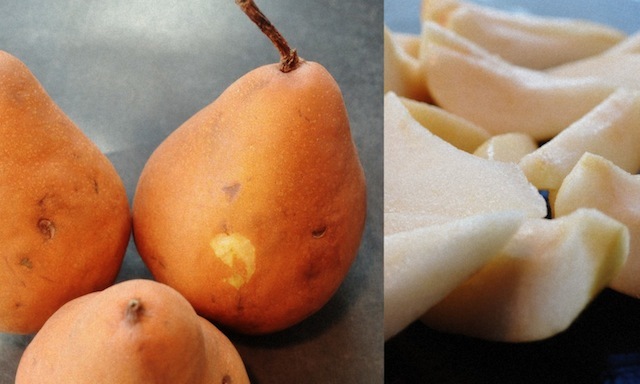 —Peel and core pears and cut each into 8 wedges. —Melt ½ stick butter in skillet over moderate heat until foam subsides. Reduce heat to low, then sprinkle ¾ cup packed brown sugar over bottom of skillet and cook, undisturbed, 3 minutes (not all sugar will be melted). Arrange pears decoratively over sugar and cook, undisturbed, 2 minutes. Remove from heat and set aside. —Preheat oven to 350 degrees. 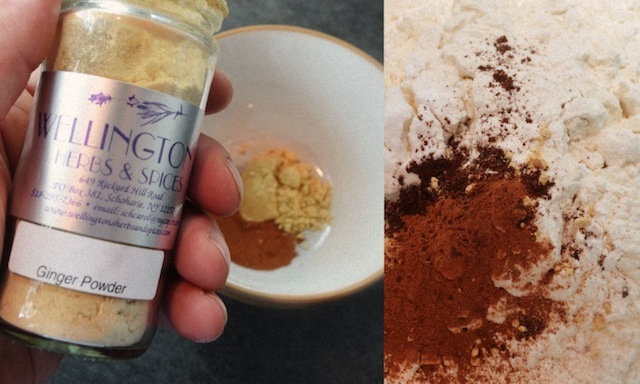 —Whisk together flour, baking soda, cinnamon, ginger, cloves, and salt in a medium sized bowl. 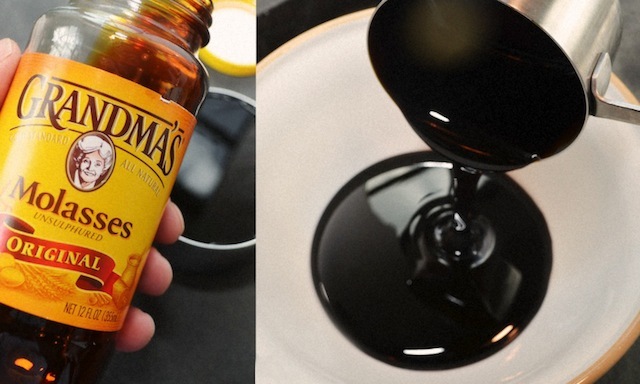 Whisk together molasses and boiling water in a small bowl. Beat together butter, brown sugar, and egg in a large bowl with an electric mixer at medium speed until creamy, about 2 minutes, then alternately mix in flour mixture and molasses in 3 batches at low speed until smooth. —Pour batter over topping in skillet, spreading evenly and being careful not to disturb pears, and bake in middle of oven until a tester comes out clean, 40 to 50 minutes. —Cool cake in skillet on a rack 5 minutes. Run a thin knife around edge of skillet, then invert a large plate with a lip over skillet and, using potholders to hold skillet and plate tightly together, invert cake onto plate. 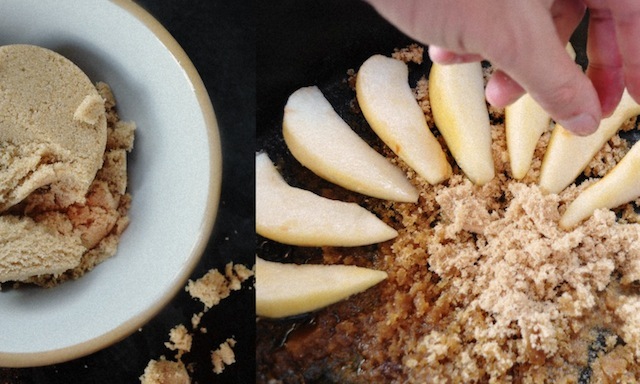 Replace any pears that stick to skillet. Serve warm or at room temperature with a scoop of vanilla ice cream. YUM! It looks so moist and fall-esque. I am dyeing to taste some right now! Yum, again! I loved the idea so much that I baked it! Mine is in the oven right now. Hope you enjoy as much as I did. Let me know how it goes!